A garden. – Sitting in her web, a spider surveys the surroundings. Entry of the ants. – They find a rose petal. – With great effort they lift the petal and carry it away. Left alone, the spider daydreams and watches the landscape. – She checks the strength of her thread. – She mends her web with the thread she has drawn from her pocket. Entry of the dung beetles. The ants return. – They prepare to carry another petal, when a butterfly appears. Dance of the butterfly. – The spider invites the butterfly to dance closer to her web. – The butterfly is caught in the web and struggles. – Death of the butterfly. The spider rejoices. – She frees the butterfly from her web and takes it to her larder. The spider dances. – Suddenly fruits come crashing down from a tree. The spider jumps backwards. Fruit worms enter and prepare to revel in the fallen fruits. Warlike entry of two praying mantises who lift their frightening blades and forbid anyone to approach. – The two worms approach and, moving between the mantises, quickly penetrate the fruits. The ants dance in a circle. – The two mantises blame each other for the trick which was played upon them. The mantises challenge each other to a duel. – They fight. – The spider dances in order to make the mantises more excited. – The mantises become caught in the web. – The spider dances. The mayfly stops, exhausted. – The ants, the spider and finally the dung beetles pay their respects. – The mayfly rejects their advances. – The ants leave. – The worms come out of the fruit. The mayfly and the fruit worms dance. The spider prepares to begin her feast, but one of the mantises, freed by the dung beetles from the web, slips behind the spider and kills her. Death throes of the spider. Funeral of the mayfly. – The funeral cortege sets off and vanishes into the distance. Night falls on the deserted garden. Lovers of hot-house Romanticism will thrill to Roussel's intoxicating brand of musical incense. The live symphony fairly crackles with high voltage passion. It is a recording (of Le Festin) to live and revel in. This would be an excellent introduction to the music of Roussel. Eschenbach's understanding of the mixture of surface charm and underlying malaise is marvellously acute, and the playing is often devastating in its brilliance. This new version of the Third Symphony is in total harmony with Roussel's idea of orchestral play and doesn't come down in comparison with the many reference recordings available (...). It distinguishes itself through its great ease and generosity. Scintillating accounts of two of Roussel's most enduring scores. (...) Eschenbach's understanding of Roussel is manifestly profound and his way with the music quietly compelling and persuasive. Very highly recommended. 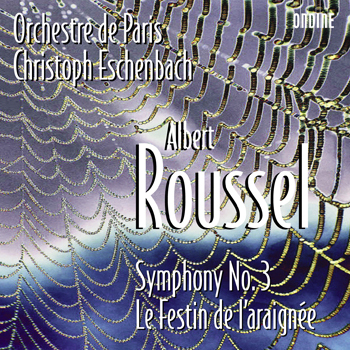 This Albert Roussel disc couples the Third Symphony with one of the composer's most popular pieces, the complete music for the one-act pantomime ballet Le Festin de l'araignée. This recording completes a cycle of three releases (ODE 1065-2, ODE 1092-2) featuring the four symphonies and two ballets by the French composer, performed by the Orchestre de Paris and music director Christoph Eschenbach. This series has contributed to the rediscovery and recent revival of the great French composer's music. The Third Symphony, which was given its world première in Boston in 1930, remains the most popular of Roussel's symphonic works. Le Festin de l'araignée (The Spider's Feast) was written to a libretto by Gilbert de Voisins and completed in 1913. It is one of Roussel's two most celebrated ballets (the other being Bacchus et Ariane, featured on ODE 1065-2). While a suite from the ballet has been recorded a number of times, few accounts of the complete score exist. The music is energetic, melodic, original, and pictorial, and the listener can easily imagine the action accompanying the music, helped by the dramaturgical annotations from the original score which are contained in the track listing of this CD. The booklet contains expert liner notes written by Damien Top from the Centre International Albert-Roussel in France, as well as rare photographs.